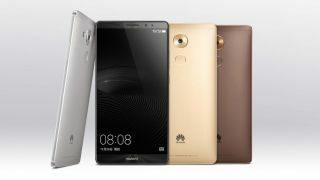 Huawei has released its new flagship phone in the form of the Mate 8 – and it comes with a 6-inch full HD screen and a fingerprint sensor on the back much like the Mate S.
Under the hood is Huawei's latest Kirin 950 SoC which includes an octa-core CPU made up of four A72 2.3GHz cores and four A53 1.8GHz cores. Huawei is promising improved voice controls, roaming, navigation and payment capabilities, and a power-saving firewall on the Mate 8, while other reports point towards a supersized 4,000mAh battery. That should hopefully yield some impressive stamina results. Huawei is also including the latest Android 6.0 Marshmallow software with a freshly redesigned Emotion UI 4.0 for the phone as well. It's not clear what Huawei has done to its UI yet, but it's only good news for us – every phone we've seen running Emotion recently has been pretty heavily customised. The Huawei Mate 8 launches in China today and will be coming to international markets right after an official unveiling at CES 2016 in January.